A book with the very best thinking and insights in the field of strategy and beyond. A unique partnership between the Brightline Initiative and Thinkers50 has created "Strategy at Work". It showcases some of the very best thinkers in the field of strategy and beyond. 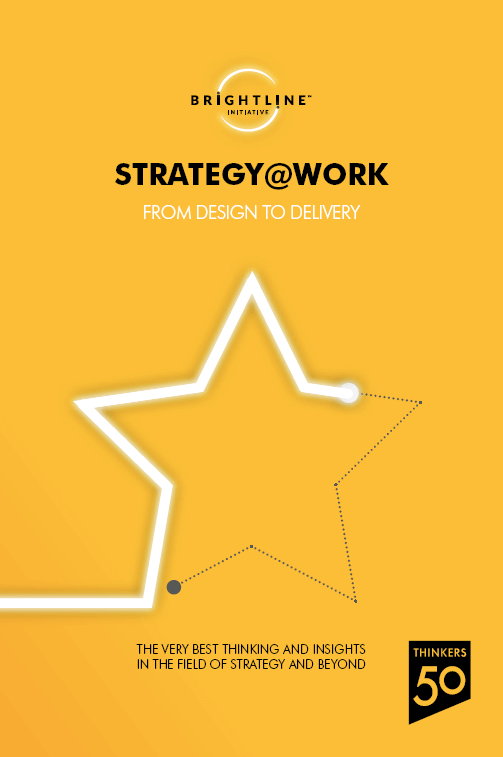 Ricardo Vargas and Edivandro Conforto wrote together a chapter of the book explaining the Brightline Guiding Principles for connecting strategy delivery with strategy design. If you ask a manager what excites them about their job, what gets them out of bed in the morning, what provides meaning to their work, their answers tend to be similar no matter where they are in the world, who they work for or what their job is. Distilled to three words it is: Getting things done. [email protected] showcases some of the very best thinkers in the field of strategy and beyond. We hope that it acts as a catalyst for readers to get things done. If you ask a manager what excites them about their job, what gets them out of bed in the morning, what provides meaning to their work, their answers tend to be similar no matter where they are in the world, who they work for or what their job is. Distilled to three words it is: Getting things done. It doesn’t matter if they’re running a production line in Qingdao, managing a team in a Silicon Valley giant or overseeing the building of a bridge in Mumbai, managers revel in the sense of completion, of turning a plan or an idea into reality; creating something; implementation. They are only human. Given this aspiration to get things done, managers and leaders have to deal with a fair amount of frustration along the way. Organizations have a patchy and somewhat indifferent record in transforming ideas, initiatives, strategies and dreams into reality. Research by Brightline with the Economist Intelligence Unit in 2017 surveyed 500 executives. We found that only one in ten reached their strategic goals, and 53 per cent agreed that poor delivery capability is a source of competitive disadvantage. A total of 59 per cent of survey respondents said that their organizations “often struggle to bridge the gap between strategy development and its practice, day-to-day implementation”. Getting things done is hard and difficult work. We live in turbulent times and creating robust and effective business strategies is hugely demanding. Turning them into reality equally so. The Brightline Initiative aims to help organizations and managers to make sense of these challenges and to make better decisions as they create and implement strategies. It is a coalition dedicated to helping organizations bridge the gap between strategy design and strategy delivery. Working with our partners at Thinkers50 we have created [email protected] It showcases some of the very best thinkers in the field of strategy and beyond. We hope that it acts as a catalyst for readers to get things done. The Thinkers50 (www.thinkers50.com) scans, ranks and shares the greatest management ideas of our times. Its definitive global ranking of management thinkers is published every two years. Since its launch in 2001, the ranking has been topped by Peter Drucker, Michael Porter, CK Prahalad and Clay Christensen. The Thinkers50 Awards have been described by the Financial Times as “the Oscars of management thinking”.